Advanced beginner to intermediate: basic knitting knowledge and pattern reading skills, knitting in the round. “Third Try” hat because it took me three tries to get the crown shaping to match the hat I had imagined. I also knit all three items,and made the pompom, with a single ball of EYB “Fair Isle” yarn. Three or third had to be in the pattern name somewhere! Hat is knit bottom up. 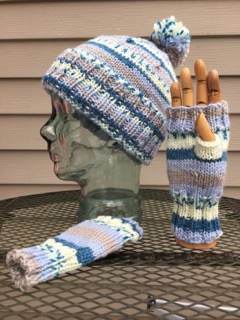 Mitts are knit top-down from the fingers to the cuff.